Join our Little Notes and Art Splash ‘Stay and Play’ sessions on Friday mornings from 9.30am to 11.00am (term time only). For children aged 18 months to 4 years. From Friday 1st March 2019, Stay and Play will cost £1.00 per family for entry and there will be additional costs for the Music and Gym sessions. The costs cover specialist teaching, materials and resources which is then fed back into the quality of our Stay and Play sessions. Please note that an adult must stay with the child who has booked during the session. We have optional extra sessions which are filled on a first come, first served basis. Get here for 9.30am to book your slot! Run by our specialist Music teacher, this session will provide a range of rhymes and songs for children. The session provides an environment that is both stimulating and nurturing for toddlers. Early experiences with music and movement give your toddler an early learning advantage. Music, specifically singing songs and speaking rhymes and chants, improves language development. Run by our specialist PE teacher, this 30 minute session is a fun and flexible workshop with activities tailored around young children. Using sport equipment, Mr Wilce will have parents and toddlers working together to build strength and those all important motor skills! For ages 3+! 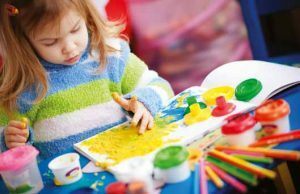 Run by our specialist Art teacher, this drop-in session will provide a range of messy art activities for children. Our Art Splash session grows the children’s confidence and independence while further developing their creative minds. The last part of the Stay and Play session is unstructured play time where children are free to roam the outdoors in our wonderful adventure playground, or choose from a range of exciting activities available in our classroom from reading, to drawing, to playing with toys. For more information on our ‘Stay and Play’ sessions please call Gilly Downs on 01943 865575, email information@ghyllroydschool.co.uk or alternatively fill in a Contact Form on the ‘Contact Us’ page on this website. For more information about our Stay and Play sessions, visit our Pre-School and Nursery pages or visit our News page to see updates from previous sessions! *From September 2018 we will be choosing charities to fundraise for i.e. Children in Need and appreciate small donations of change in exchange for a hot drink. Thank you in advance.